Gabrielle Union attended PORTER’s 3rd annual Incredible Women Gala on Tuesday (October 9) in Los Angeles, California. 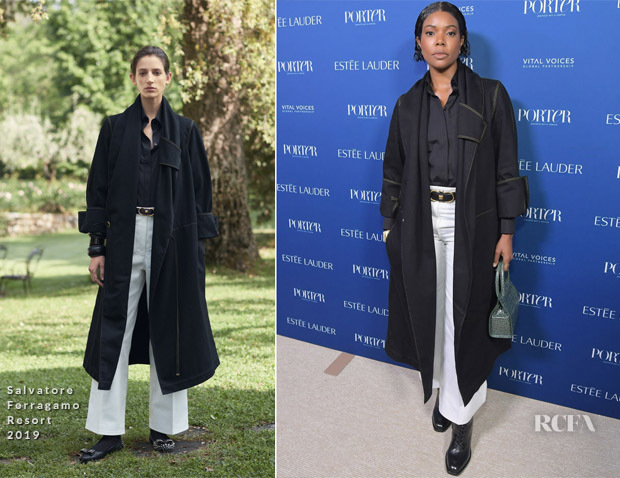 When you think of gala, gowns spring to mind, but Gabrielle marched to the beat of her own drum in this Salvatore Ferragamo Resort 2019 look featuring a shawl collar denim coat and white denim trousers. There might be some discord as to the message she is sending out with this particular look. Some may feel that she just wanted to be relaxed for the evening, or some may feel that she opted for a look with masculine undertones to celebrate that women can be whoever they want to be. Ileana Makri earrings, By Far bag and Frye boots completed her look. Who Was Your Best Dressed At The 2018 American Music Awards?